Spiers & Pond was the first large-scale catering business in the world. It organised the first cricket test match between England and Australia, helped to popularise dining in the West End of London, and commissioned the Criterion Theatre. Gold was discovered in Melbourne, Australia in the early 1850s. The booming economy attracted Felix William Spiers (1832 – 1911), the son of a London shipbroker, and Christopher Pond (1828 – 1881), a former printer’s apprentice from Camberwell in Surrey. Spiers and Pond formed a partnership in 1858 and acquired the lease of the Cafe de Paris, adjacent to the Theatre Royal on Bourke Street, one of Melbourne’s principal thoroughfares. Modelled on Simpson’s restaurant on the Strand, London, it was elegantly decorated, with stained glass domes, polished oak and rosewood floors and palatial fittings. 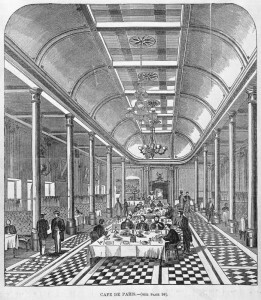 The Illustrated London News declared in 1861, “there are few public dining rooms in the world superior to the cafe [de Paris]”. The Cafe de Paris would frequently serve more than one thousand people a day. The pair of men complimented each other, with Pond acting as the charming mein host, and Spiers serving as the accountant. Pond had Bohemian tendencies, and cultivated the patronage of Melbourne’s acting and literary set. Impressed by the large numbers of spectators at cricket matches, Spiers & Pond sponsored the first ever tour of an English national cricket team to Australia in 1861-2. Each player was paid £150 plus first class travel expenses. Spiers & Pond made a fortune from the venture. 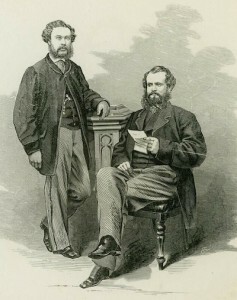 Spiers attempted to convince Charles Dickens (1812 – 1870) to give a reading tour of Australia in 1862, but the author had to decline for health reasons. Spiers & Pond sold their Melbourne assets in early 1863 and relocated to Britain. They had noticed the poor state of railway catering in their homeland, and saw an opportunity for improvement. They secured a concession in a railway arch at the Metropolitan Railway’s newly-opened Farringdon Street Station, from where they sold buns and other ready goods. Spiers & Pond paid the railway company a proportion of their takings in lieu of a fixed rent, in order to ensure a mutual interest in the success of the venture. Spiers & Pond had established concessions at several Metropolitan Railway stations by 1864. They won the catering contract for the London, Chatham and Dover Railway in 1865. 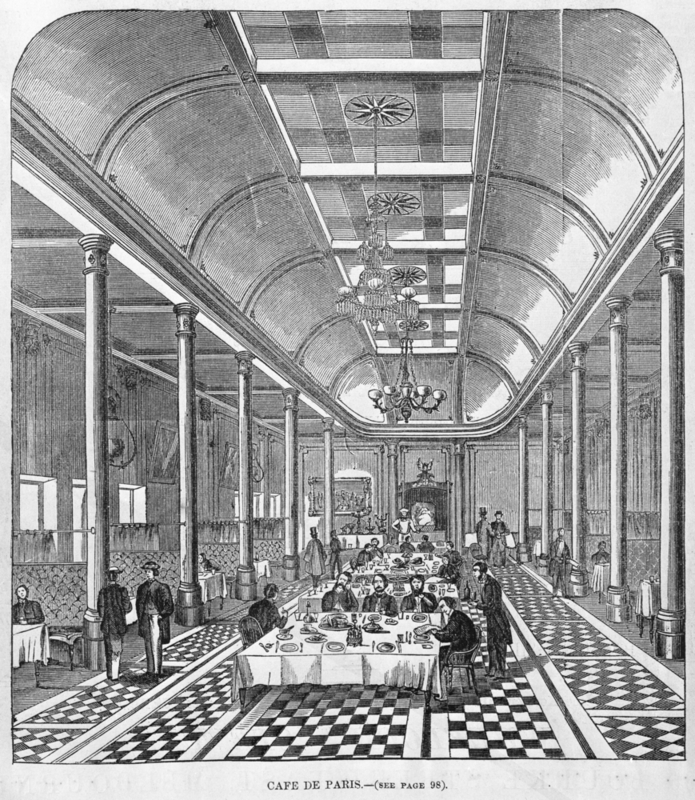 Two elegant London restaurants were opened in 1866, one at Ludgate Hill Station and another at Victoria Station. The Ludgate restaurant became a popular haunt for bohemian and literary types. Charles Dickens praised it as one of the first places in the country where the railway traveller could get “wholesome food, decently served”. Spiers & Pond employed around 800 people by 1867, and operated 21 refreshment bars, including 18 on railways. Spiers & Pond claimed to be the first to popularise low-cost wine in Britain. Spiers & Pond helped to popularise dining in the West End. They took over the Gaiety restaurant in 1869, next to the famous theatre on the Strand, which became one of the most popular restaurants in London. They built the Criterion restaurant and Criterion Theatre in 1873. Spiers & Pond became well-known for hiring attractive barmaids. Dickens described the women in their employ as “bright-eyed, cheerfully obliging nymphs”, whose beauty helped to draw in male patrons. George Augustus Sala (1828 – 1895) pointed out their “fine physiques”. Spiers & Pond had refreshment rooms at over 100 railway stations on nine different railway lines by 1873. The railway bars sold 8,000 gallons of sherry every week. The two partners attributed their success to “capital, enterprise [and] experience”. Before long, Spiers & Pond held the catering contracts for every major railway line, supplied from a large central depot at Ludgate Hill. Spiers & Pond also diversified into the general store business, and established a mail-order catalogue. Spiers & Pond acquired numerous hotels from 1879 onwards, including the Victoria Hotel in Manchester (lease bought for £33,000 in 1891) and Bailey’s Hotel on Gloucester Road (1894). When Pond died in 1881 he was regarded even in America as “probably the greatest caterer in the world”. It was estimated that the enterprise could feed 200,000 to 300,000 people every day. Pond’s personal estate was valued at over £215,000. Shortly after Pond’s death, Spiers & Pond was incorporated with a capital of £500,000. Spiers & Pond had 219 refreshment rooms at railway stations by 1886. There were 6,000 employees by 1891, including 1,000 women. Spiers & Pond had a share capital of £600,000 and catering contracts with 15 railway lines by 1899. The railways noted the profitable nature of the Spiers & Pond refreshment rooms, and some began to take their catering concessions in-house . Meanwhile, competition intensified as J Lyons entered the railway catering market. As a result, Spiers & Pond began to increasingly focus on its hotels estate. The Ludgate Hill Station restaurant was sold to J Lyons in 1905. Spiers retired to Paris in 1905. He died in 1911 with an estate valued at over £150,000. Following reduced profits, the directors stepped aside in 1906 and handed management of the company to a shareholder committee. Due to a reduction in the value of licensed properties, Spiers & Pond reduced its capital from £1.2 million to £720,000 in 1907. Spiers & Pond was forced to deny rumours that J Lyons planned to takeover the company in 1911. A new board of directors and managing director were appointed in 1913. Due to difficult trading and labour shortages caused by the war, as well as recent licensing legislation, Spiers & Pond entered into receivership in 1916. Unprofitable properties were divested, and the company re-emerged in a stronger position. The Criterion Theatre and Restaurant was sold to Charles E Cottier, a director of W & G Buszard, in 1917. Spiers & Pond was again forced to deny rumours that it was a takeover target in 1922. The Times stated that Spiers & Pond were, “almost the only contractors for dining-car services on the English railways” in 1925. The Aerated Bread Company, which had recently acquired a string of catering companies, made a takeover offer for Spiers & Pond in 1928. Spiers & Pond directors, who controlled the company’s votes, rejected the bid, although the two companies maintained a friendly working relationship. The Southern Railway contract was lost after 40 years in 1930, following a lower bid from a rival. The Queen’s Hotel in Eastbourne was acquired in 1937. Spiers & Pond acquired the Alford House development opposite Victoria Station in London from the Aerated Bread Company for over £500,000 in 1959. Spiers & Pond was acquired by Express Dairy for £5.5 million in 1960. It was a friendly takeover, approved by the directors who retained the majority of voting shares. At this time Spiers & Pond was a leading hotelier in Britain with 13 hotels, as well as Chicken Inn restaurants in London and 18 restaurants. Spiers & Pond acquired the Royal Hotel in Scarborough in 1964. The company built the Viking Hotel in York for £850,000 in 1968. Express Dairy was acquired by Grand Metropolitan, a hotels company, in 1969. Spiers & Pond was absorbed into the Grand Metropolitan network of hotels.